illy launches the “Design illy time” casting through Desall.com, looking for innovative proposals of the clock wall that will be positioned in the Italian and foreign points of sale across the illy distribution channel. illy is the famous Italian brand worldwide appreciated for the high quality and unique velvety taste of its coffee. illy wants to create an experience of maximum enjoyment, providing the best-quality coffee nature can give us and the most advanced technologies allow to produce. The world of art and design characterises the illy brand that, through “Design illy time”, wants to find two new versions of wall clock able to create a surprise result and communicate the concept of quality and beauty in an innovative way. Participants need to design two versions of a wall clock that illy will present to the Italian and foreign points of sale of its distribution channel to be displayed inside their spaces. The versions, one basic and one premium , should differ from each other by graphics, materials and production costs. Both versions must incorporate the illy logo and be conceived with a highly innovative and surprising design safeguarding the brand image of illy. The participants are requested to submit one proposal per version, each submitted as separate upload (viz. one upload for the basic version, another upload for the premium version) on Desall.com. The participants are invited to upload one or more proposals per version and to work on both versions. Communication : the wall clocks illy is looking for should be a communicative furniture items, able to communicate the illy image in an original and effective manner. Take inspiration from illy world and interpret the brand values and its commitment to quality and excellence in a fresh and innovative way. Target : the wall clocks will be a gift for the Italian and foreign cafès, restaurants and distributors. Pay attention that these points of sale are very different from each other so think about a design that will be suitable for different decor. Style : think to an unpublished , original and elegant design. Clocks can reuse and reinterpret shapes, materials and visual of some items that represent illy icons (see Material file ). Please note that it is not necessary that the two versions have the same style , due to the fact that they will not positioned simultaneously in the same space. Technical characteristics : both versions should include a hook system that allows them to be mounted on a wall and should embody a solid and resistant structure. There are no limits regarding the use of an analogue or digital clock. Dimensions : the maximum size for both clocks: 55cm (length), 25cm (height), 10cm (width). Materials : clocks should be made of resistant materials so they may arrive at the clients without damages. Recycled or eco-friendly materials are preferable but not essential. Target cost : the clocks production cost and materials (including transport) must be €15 for the basic version , €35 for the premium version . Deliverable: for naming your entry, please follow this format: “Basic – name of the project” and “Premium – name of the project”. Note well: the illy brand, the icons property of illycaffè and each particularity of illycaffè will remain property of illycaffè . 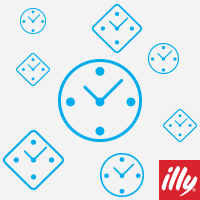 Do you want to stay updated about "Design illy time"?